Trust in our partners is important for economic transactions, but time pressure might affect the level of trust we place in others. This column reports the results of an experimental game in which individuals choose how much trust to place in partners who either must respond instinctively, or have time to reflect. Less-reflective personality types incorrectly trusted their partners least when those partners had time to think. This has implications for policies which, for example, impose cooling-off periods on negotiations. Trust is important for the economy. Empirical research from Zak and Knack (2001) to Algan and Cahuc (2010) has established that changes in trust over the 20th century explain much of the evolution of economic development for many countries. But we do not trust others universally, or unconditionally. Our trust in others depends on our belief about what they will do to us when we trust them. For this reason, we often devote substantial resources to evaluate the trustworthiness of our partners, either about their identity (DeSteno et al. 2012) or the process through which they make decisions (Capraro and Kuilder 2016). The amount of time that our partners have when they take a decision is a relevant piece of information. Do we trust people who are forced to respond quickly without reflection more, or those who have the time to reflect before responding? Time pressure can trigger intuitive, automatic decision processes, whereas slow decisions allow for deliberation and reflection. Since these processes can affect strategic behaviour (Kahnemann 2011, Rand et al. 2012), it is logical for people to consider the time that their strategic partners have when those partners make choices. This is important for survival. We might even have evolved an ability to anticipate correctly the consequences of external circumstances, such as time constraints, on the trustworthiness of others (Tooby and Cosmides 1990). Previous research has studied the effect of fast and slow decision-making in social interactions (Rand et al. 2012, Rand 2016, Capraro et al. 2017), but we understand less about whether people correctly anticipate such an effect. Some evidence suggests that reflective decisions might be perceived as less prosocial (Capraro and Kuilder 2016, Jordan et al. 2016) and emotional responses are perceived to lead to more prosociality than ‘reason’ (Levine et al. 2017). In all those cases, however, the reflective (or not) nature of decisions is endogenous, rather than externally imposed. Yet, there are often situations when we need to take a decision quickly due to external circumstances, both in government action (how to react to a military invasion, a coup d’état, or a suspected crime), or in business (the Dow Jones Index is plunging, or a passenger has been dragged forcibly off a flight and we need to make a statement). There is only one previous experiment we know that has evaluated how individuals perceived the effect of external time constraints on the social behaviour of others. Evans and van de Calseyde (2017) used time constraints in a public goods game. They found that fast decisions were not expected to be any more or less cooperative than slow decisions when time constraints were externally imposed. Given that expectations were elicited for a hypothetical person, however, they could check whether the expectations were correct. We study this issue experimentally (Cabrales et al. 2017) using the Trust Game (Berg et al. 1995). In our experiment, the ‘trustor’ can send any portion of an endowment ($10) to a ‘trustee’. This amount is then tripled for the trustee, who may reciprocate (or not) by sending back any portion of the amount. The key innovation in our design is that the trustee is forced to make this decision in under 10 seconds in one condition, or after a delay of more than 10 seconds in the other. At the outset, the trustor is informed of the trustee’s time constraint. Clearly, anticipating the trustee’s response is critical for the trustor to make a correct decision. A trustor who believes that the trustee is worthy of trust can send the entire endowment, which leads to the overall efficient outcome. But this is risky. If the trustee is spiteful or selfish, the trustor could end up with nothing. 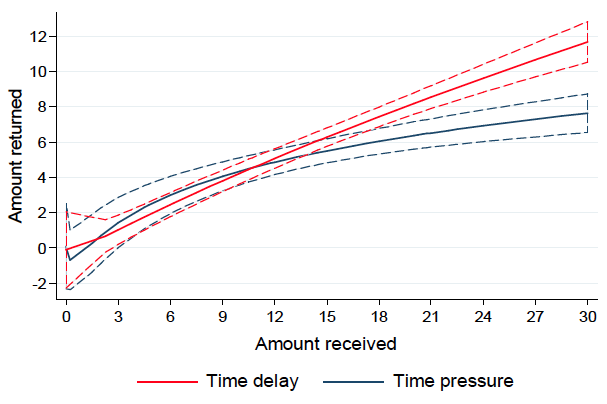 We found that the trustors in general send more money if the trustee is under time pressure than they do in the time delay condition (Figure 1). More specifically, there are more low-to-medium values trust decisions in the time delay condition. Note: Dashed vertical lines are means. This suggests that the trustees were expected to be less trustworthy when they had more time to think, although the effect was not very strong. 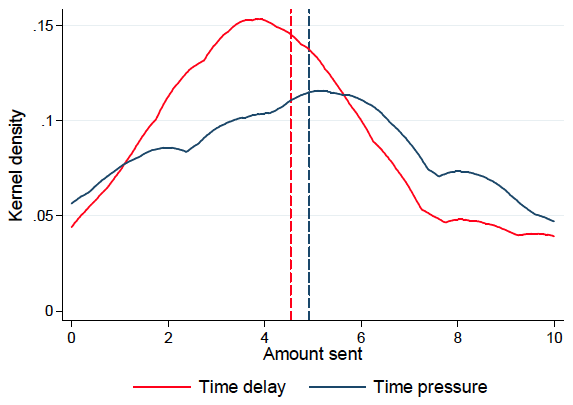 On the other hand, this lack of trust seems to be incorrect, as the proportion returned in the time delay condition was higher than it was when the trustee was under time pressure, provided the amount trusted was high (Figure 2). 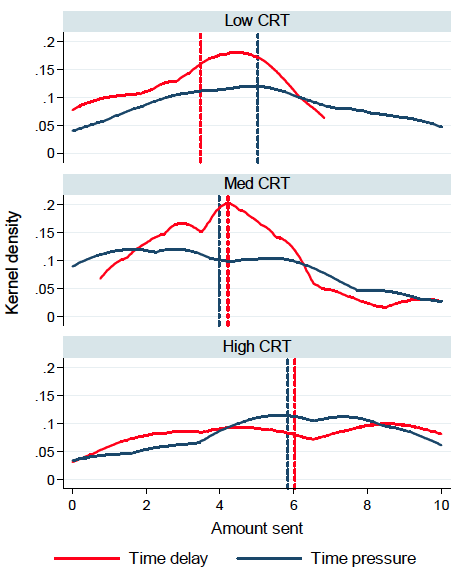 Thus, time delay is associated with more trustworthiness. Note: Dashed lines depict 90% confidence intervals. Not all trustors make the same mistake. When we measure the cognitive style of participants using the Cognitive Reflection Test (Frederick 2005), we observe that the least reflective individuals (those who rely more heavily on intuition) trust reflective decisions least (Figure 3). It seems that our first intuition is to distrust reflective decisions, but further reflection leads us to override this (incorrect) inclination. Note: Dashed vertical lines depict means (time delay: red line, time pressure: blue line). These results suggest that individuals do not correctly anticipate how the time available for decision-making affects the choices that their partners make. This could have important in practical applications. For example, cooling-off periods are often imposed in negotiations (Cramton and Tracy 1994, Oechssler et al. 2008), divorce decisions (for South Korea as an example, see Lee 2013), and consumer purchases (Sher 1973). Furthermore, stock markets across the world have built-in circuit-breakers in case of unusually large price movements. Our experiments show that the individuals involved in these transactions might not correctly anticipate the effect of forced delay. This could lead to significant efficiency losses. Algan, Y and Cahuc, P (2010), “Inherited trust and growth”, The American Economic Review 100(5): 2060-2092. Berg, J, Dickhaut, J, and McCabe, K (1995), “Trust, reciprocity, and social history”, Games and Economic Behavior 10(1): 122-142. Cabrales, A, Espín, A M, Kujal, P, and Rassenti, S (2017), “Humans' (incorrect) distrust of reflective decisions”, CEPR Discussion Paper No. 11949. Capraro, V, and Kuilder, J (2016), “To know or not to know? Looking at payoffs signals selfish behavior, but it does not actually mean so”, Journal of Behavioral and Experimental Economics 65(Dec): 79–84. Capraro, V, Corgnet, B, Espín, A M, and Hernán González, R (2017), “Deliberation favours social efficiency by making people disregard their relative shares: Evidence from USA and India”, Royal Society Open Science 4(2): 160605. Cramton, P C and Tracy, J S (1994), “Wage Bargining with Time-Varying Threats”, Journal of Labor Economics 12(4): 594-617. DeSteno, D, Breazeal, C, Frank, R H, Pizarro, D, Baumann, J, Dickens, L, and Lee, J J (2012), “Detecting the trustworthiness of novel partners in economic exchange”, Psychological Science 23(12): 1549-56. Evans, A M, and van de Calseyde, P P (2017), “The effects of observed decision time on expectations of extremity and cooperation”, Journal of Experimental Social Psychology 68: 50-59. Frederick, S (2005), “Cognitive reflection and decision making”, The Journal of Economic Perspectives 19(4): 25-42. Jordan, J J, Hoffman, M, Nowak, M A, and Rand, D G (2016), “Uncalculating cooperation is used to signal trustworthiness”, Proceedings of the National Academy of Sciences of the US 113(31): 8658-8663. Kahneman, D (2011), Thinking, fast and slow, Macmillan. Knack, S, and Keefer, P (1997), “Does social capital have an economic payoff? A cross-country investigation”, The Quarterly Journal of Economics 112(4): 1251-1288. Lee, J (2013), “The impact of a mandatory cooling-off period on divorce", The Journal of Law and Economics 56(1): 227-243. Levine, E E, Barasch, A, Rand, D G, Berman, J Z, and Small, D A (2017), “Signaling emotion and reason in cooperation”, Working paper. Oechssler, J, Roider, A, and Schmitz, P W (2015), “Cooling Off in Negotiations: Does it Work?”, Journal of Institutional and Theoretical Economics 171(4): 565-588. Rand, D G, Greene, J D, and Nowak, M A (2012), “Spontaneous giving and calculated greed”, Nature 489(7416): 427-430. Rand, D G (2016), “Cooperation, Fast and Slow Meta-Analytic Evidence for a Theory of Social Heuristics and Self-Interested Deliberation”, Psychological Science 27(9): 1192–1206. Sher, B D (1967), “The cooling-off period in door-to-door sales”, UCLA Law Review 15: 717. Tooby, J, and Cosmides, L (1990), “The past explains the present: Emotional adaptations and the structure of ancestral environments”, Ethology and Sociobiology 11(4-5): 375-424.